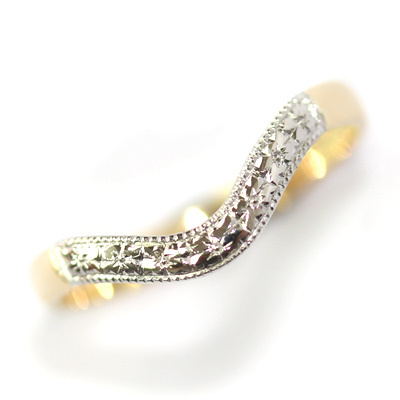 Yellow and White Gold Engraved Fitted Wedding Ring — Form Bespoke Jewellers Ltd.
A bespoke yellow and white gold fitted wedding ring with pretty, engraved details. This beautiful fitted wedding ring has a soft wave in the band which sweeps neatly alongside the customer’s engagement ring. The majority of the band is cast in yellow gold, however the top of the band is cast in white gold. This complements the engagement ring beautifully whilst also allowing for a clever design detail. Rather than setting diamonds into the white gold section, the customer chose pretty star engraving with a millgrain frame. The light refracts off the bright, white, undulating surface providing a pretty, sparkling illusion. A clever twist on the classic fitted wedding ring style.